Nancy, a certified Iyengar yoga teacher, first experienced her own scoliosis after a fall in the late 90’s. She then began participating in scoliosis workshops with Iyengar teachers, most notably Elise Miller, and found the treatment to be very effective. She pursued scoliosis practicum training with Elise in order to work on scoliosis issues with students who need this focus. In addition to her own workshops, Nancy assists Elise when she comes to the New York area to conduct workshops. 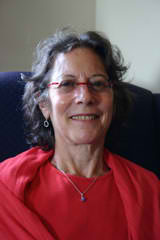 Nancy has been teaching yoga since 1995 in her hometown of Scarsdale, just north of New York City. At her studio, Iyengar Yoga Scarsdale, she offers small classes for 8 or fewer students in a fully equipped, rope wall studio. There, she can focus on her students offering experienced/ hands on attention as well as giving private sessions when needed. Nancy has also taught classes and workshops in local studios and at Manhattanville college. She currently teaches her own classes at Be True Yoga in Scarsdale, the Greenwich Arts Center, and assists in the therapeutics/special needs class at the Iyengar Institute in N.Y.C taught by its senior teachers. Parallel with pursuing and obtaining masters degrees as a dancer, dance therapist, and psychologist [during the 70s and 80s], Nancy studied in a Buddhist seminary and lived in Buddhist communities. She formally began meditation practice in 1973 with Tibetan Buddhist Lama Chogyam Trungpa Rinpoche and spent time in meditative retreats. From an inspiring “ah ha” moment at the beginning, meditation was as antidote for the psycho/social turmoil she experienced in the late 60’s and early 70’s that helped Nancy to listen and connect inwardly and cultivate joy instead of anxiety and suffering. After completing her formal training and working as a dance therapist and dance improvisation teacher, (raising 4 sons in the process), Nancy began to study with Mary Dunn in 1994 . Mary was a revered and dedicated teacher, whose mother brought B.K.S. Iyengar, the inspiration and creator of the Iyengar “method” of teaching hatha yoga, to the U.S.A. to teach in 1973. Nancy continues training with senior Iyengar Yoga teachers in the U.S.A and in Pune, India, where she went for the fifth time in summer of 2014 to study at the source with the Iyengars themselves, just before B.K.S. Iyengar’s passing. ** Nancy is an Iyengar Certified Instructor who has done additional training with Elise to become a Yoga for Scoliosis certified instructor. She is highly qualified because of her Iyengar training and has a deep understanding of how to work with scoliosis.